Q. 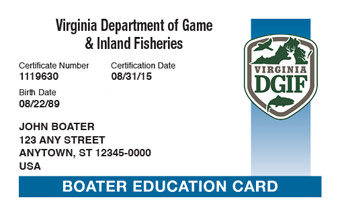 What is the Virginia Boating Safety Education Certificate? A. The Virginia Boating Safety Certificate (also known as the Virginia Boating License or boaters license) is proof that you have met the mandatory boat safety education requirements for the State of Virginia. The Virginia Boating Safety Certificate is good for life and does not need to be renewed. A.The boating safety education certificate is proof that you have successfully completed a boating safety course. The safety certificate does not expire and does not need to be renewed. Therefore it is NOT a Virginia Boating License although that's what most people call it since they are used to the term. Q. I do not have a driver's license. Can I still get the Virginia Boating Safety Certificate? A. Yes. You are not required to have a state driver's license in order to obtain a boating safety education certificate. Q. How can I get my Virginia Boating Safety Education Certificate? Q. Who needs a Virginia boater license? All PWC operators age 14 and older and all motorboat operators regardless of age need to take a boating safety course. For more information please consult the Virginia boating laws and regulations. A. There is a one–time fee of $29.95 paid to BOATERexam.com®. It includes unlimited free retries of the chapter quizzes, as well as printing and shipping of your permanent card. Learn more about BOATERexam.com's Risk-Free Policy. BOATERexam.com® also offers some tips and tricks on passing the boating license test for those who wish to further prepare for their course. A. You need a grade of 90% or higher on each of the end of chapter boating license tests to pass the course. That means 9 correct answers out of 10 on each of the tests. A. At the end of each chapter of the boat safety course, you will have the option of taking a practice test before you attempt the actual end of chapter test. These are short boater exam practice tests that cover the same topics that are present in the boating license tests. Q. Is anyone exempt from obtaining the Virginia Boater License? A. Yes, there are certain exemptions from the boat safety education requirement. For more information, check out the Virginia Boating Laws page.